Founded by the Teutonic Knights in 1211 on an ancient Dacian site and settled by the Saxons as one of the seven walled citadels*, Brasov exudes a distinct medieval ambiance and has been used as backdrop in many recent period films. The location of the city at the intersection of trade routes linking the Ottoman Empire and western Europe, together with certain tax exemptions, allowed Saxon merchants to obtain considerable wealth and exert a strong political influence in the region. This was reflected in the city's German name, Kronstadt, as well as in its Latin name, Corona, meaning Crown City (hence, the coat of arms of the city which is a crown with oak roots). Fortifications were erected around the city and continually expanded, with several towers maintained by different craft guilds, according to medieval custom. Brasov is home to one of the the narrowest streets in Europe. The Rope Street (Strada Sforii) is approximately four feet wide and it links Cerbului Street with Poarta Schei Street. This street was initially used as an access route by firefighters. Stroll around the old Town Hall Square (Piata Sfatului) where you can admire colorfully painted and ornately trimmed baroque structures. Take a peek inside the Black Church (Biserica Neagra), the largest gothic church in Romania. Its name derives from damage caused by the Great Fire of 1689, when flames and smoke blackened its walls. The interior is impressive and well-kept and houses one of the largest organs in Eastern Europe. Nearby are towering mountains, rolling fields, thick forests and villages with fortified churches. The Saxons built massive stone walls and seven bastions around the city that are still visible today, as well as ornate churches, elaborately trimmed buildings and one of the finest central squares in the country, said to be the spot to which the legendary Pied Piper led the children of Hamlin. 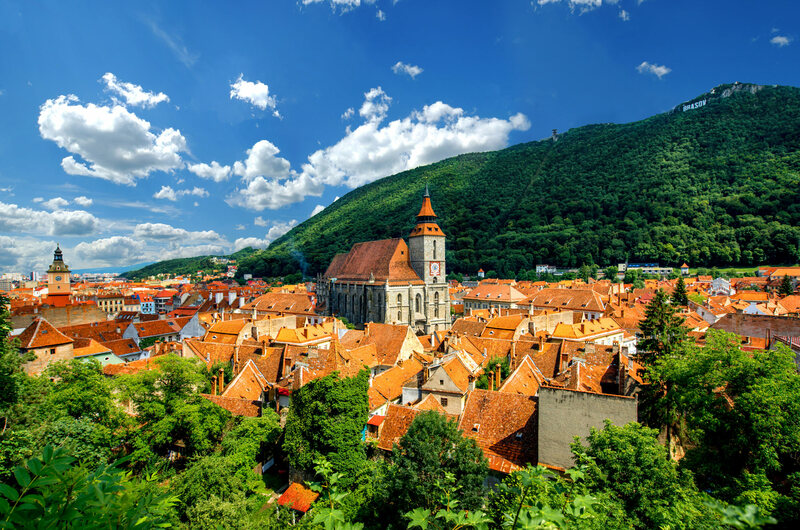 Located at the heart of old medieval Brasov and lined with beautiful red-roofed merchant houses, the Council Square, known to the Saxon population as the Marktplatz, is a nice place to rest and soak in the beautiful scenery. Built in the 13th century, the house served as meeting place for the town councilors, known as centurions. On top of the building sits the Trumpeter's Tower, used during the Middle Ages as a watchtower for warning the citadel inhabitants of approaching danger. 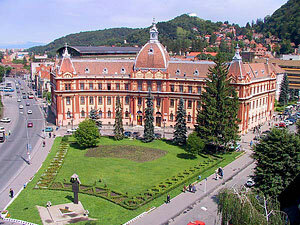 Today, the old city hall houses the Brasov History Museum (see museum details). (September 16 –June 14); Mon. - Sat. 10:00 a.m. - 5:00 p.m. (June 15 – September 15); Closed Sun. Brasov's famous landmark and Romania's leading gothic church, the Black Church towers over the Council Square and the old town. Built between 1385 and 1477 on the site of an earlier church (destroyed by Mongol invasions in 1242), the construction of the Marienkirche, as it was known in German, was hampered by extensive damage caused by Turkish raids in 1421. The church was given its new name after disaster struck again in 1689, when the Great Fire leveled most of the town, blackening the walls of the church. Restoration took almost 100 years. Of two towers planned, only one was finished. The Black Church is the largest gothic church between Vienna and Istanbul. 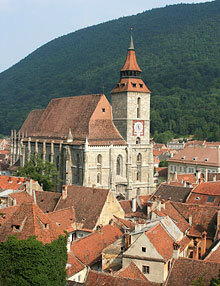 The Black Church boasts the largest church bell in Romania, weighing in at seven tons. The original gothic interior got a makeover during restorations, and the lofty, light space you see today is mostly baroque. The interior is beautiful, with balconies, stained glass windows, an enormous organ, stone columns and walls adorned with fabulous Turkish carpets. The church windows have recently been fitted out with special UV-filtering glass to protect the 119 Anatolian carpets. Thankful to have survived their trips into the "barbaric" lands south and east of the Carpathians, German merchants donated the carpets to the church in the 17th and 18th centuries. The collection is the largest of its kind in Europe. Listen to the impressive 4,000-pipe organ dating from 1839 during concerts held here three times a week in the summer. Ever since Saxon settlers arrived in the early 12th century, invading Mongols, Turks and others gave them a tough time, repeatedly destroying the old settlements of Bartholoma and Corona. Thereafter, the Saxons set themselves to building fortifications around their town. Most work was done between 1400 and 1650, when outer and inner walls were erected, together with massive defense towers and gates. Part of the defensive wall, once 40 feet high, seven feet thick and two miles long, can still be seen today, though most was taken down in the 19th century to make room for the city's expansion. Of the original seven bastions, only a few have survived, including the newly renovated Graft Bastion, located in the middle of the citadel's northwest wing. On the west side of the wall, walk along picturesque Dupa Ziduri Street (Dupa Ziduri means Behind the Walls) to catch a glimpse of the 15th century White and Black Towers. The Blacksmiths' Bastion, one of the original seven built and guarded by the city's guilds, is located at the southern end of Dupa Ziduri Street. Follow the city wall southeast to the fairy-tale Catherine's Gate. Built in 1559 and once the main entrance to medieval Kronstadt, it is the only original city gate to have survived the test of time. Nearby is the classicist Schei Gate, built in 1827. The Weavers' Bastion can be admired on George Cosbuc Street. The newly restored 16th century bastion (1521) has four levels, accessible through interior staircases. Levels two, three and four host an array of medieval artifacts exhibits, while level one serves as a rest area for visitors. Located near Graft Bastion, the semicircular White Tower was completed in 1494. A wooden staircase spirals up four levels, offering a great view of the old town. Located high on a hill, you'll have to climb some 200 steps to reach it. The squared Black Tower, also built in 1494, stands atop a rock on Starja Hill near the Blacksmiths' Bastion. The tower received its name from a severe fire in 1559 when it was struck by lightning. Recently renovated and boasting a pyramid-shaped glass roof, the Black Tower houses a small war-related artifacts museum. There are four floors inside, each reached by a narrow wooden ladder. Climb all the way to the top for a panoramic view of the Black Church. First attested in 1529, the Blacksmiths' Bastion is now home to the Brasov Archives which hosts more than 100,000 old and rare documents, including 80 valuable 14th - 16th century letters. Among them is the oldest letter in the Romanian language, written in 1521 by Neacsu, a merchant from the town of Campulung. 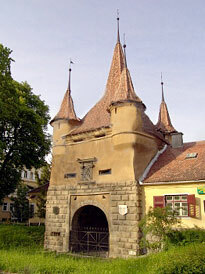 Catherine's Gate, erected in 1559 by the Tailors' Guild, is the only original gate to have survived from medieval times. The fairy-tale tower we see today was part of a bigger structure, which unfortunately, was demolished in 1827. 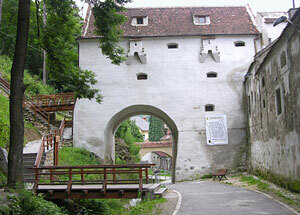 The original structure can be seen at the Weavers' Bastion Museum where a large model of 16th century Brasov is displayed. The four small corner turrets (as seen in other Saxon citadels) symbolized the judicial autonomy of the Town Council which could apply, if necessary, the death penalty. Above the entrance, the tower bears the city's coat of arms: a crown on a tree trunk. Entry to the Schei district from the walled city was marked by the Schei Gate. Old documents mention it, also, under the name of Porta Valacce (Wallachs'Gate) because it was the only entrance for the Romanians living in Schei. They were not allowed to use any of the other entrances. The structure standing today was built in 1827 by Emperor Franz I and replaced the old Schei Gate which had been heavily damaged by fires. The gate resembles a triumphal arch with three openings. Above the small arches on both sides, you can see Latin inscriptions. Strategically located on a hill overlooking the town and the plains to the north, the citadel was part of Brasov's outer fortification system. Built in wood in 1524, it was replaced with a stone structure in the 16th century, only to be abandoned in the 17th century after technological innovations made cannons stronger than the building. Today, it serves as a restaurant. Built during 1421-1436 and rebuilt in 1570-1573, this is the largest medieval bastion in Brasov and the best-preserved among the seven original watchtowers constructed around the city walls. Today, the Weavers' Bastion houses an interesting museum (see museum details) that can be visited on the way up Tampa Mountain. 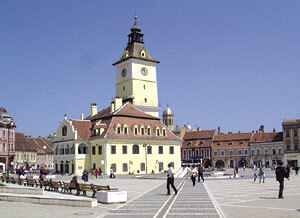 Brasov is often referred to as the city at the foot of Mount Tampa. Above the Weavers' Bastion, along the southeastern side of the fortress walls, there is an alley (Aleea Tiberiu Brediceanu), shaded by old trees and dotted with benches. From here, one can hike to the top of Tampa Mountain, where the original defensive fortress was built. 40 merchants who refused to pay trade taxes were impaled, of course, on top of the mountain. Walking to the top takes about an hour; just follow the 'red triangle' marked trail that begins at the cable car (lower) boarding point or the yellow triangle marked trail which continues from Brediceanu Alley. Those in a hurry or not in the mood for a little hiking, can take the cable car to the peak of the mountain (3,200 feet high). The great: views of Brasov, from the top of Tampa Mt., are superb. During the Saxon rule of Brasov, from the 13th to the 17th century, Romanians were forbidden from owning property inside the citadel walls and so they settled in the southwestern Schei district. Romanians could only enter the town at certain times and had to pay a toll at the gate for the privilege of selling their produce inside the citadel. Every spring, thousands of Romanians gather at Solomon's Rocks for a massive picnic and sing-along, after following the traditional Junii Brasovului procession through town. This festival celebrates the one day a year that Romanians were allowed to enter the Saxon town freely. Walk up Strada Prundului to Piata Unirii and the beautiful St. Nicholas Church; then, wander around the small curving streets that gradually slope upwards against the hill. Continue to the southern end of Schei and you'll end up on the gravel road to the impressive Solomon's Rocks (Pietrele lui Solomon), a popular picnic area for locals during the weekend but relatively quiet all other times. Saint Nicholas' Church dominates the Schei District. First built in wood in 1392, replaced with a stone structure in 1495 and considerably expanded in the 18th century, the church is a true architectural masterpiece. With a mix of Byzantine, baroque and gothic styles, it features a slender tower and four corner towers. Like other medieval churches, it is surrounded by protective walls with large wooden gates. The enclosure shelters a small old cemetery where several *prominent people of Romania are buried. The First Romanian School, now a museum (see museum details), the Library and the Archives of Saint Nicholas Church also are found on nearby grounds. * The old cemetery shelters the grave of Nicolae Titulescu (1882-1941), finance minister, foreign minister and president of the League of Nations. The monument near his grave quotes a line from his will: "I wish to be buried in Transylvania. My friends will know to find a place according to my wish." The monastery was built by the Lutherans in 1725 on the ruins of an old building destroyed by fire. Later, it was given to the Franciscans monks. It houses a 1729 organ. Built between 1776 and 1882 on the site of an old Dominican church, the cathedral is considered to be the most representative baroque style building in Brasov. Located on the east side of the Council Square, opposite the Old Town House, the Romanian Orthodox Cathedral was built in a glaring Byzantine style in 1896 and displays some impressive interior frescoes and decorations. On Saturdays, brides and grooms line outside (being careful to avoid glancing at each other - bad luck) to get married here. Considered the oldest architectural monument in Brasov, this church was built in 1223 in Roman architectural style mixed with early gothic elements. Inside, you can admire an ancient sundial on the southern side of the tower, as well as remarkably well preserved fragments of original frescoes. Not as richly decorated as other churches, Saint Martin Church has preserved its original 15th century form. Jews have lived in Brasov since 1807, when Rabbi Aaron Ben Jehuda was given permission to live in the city, a privilege until then granted only to Saxons. 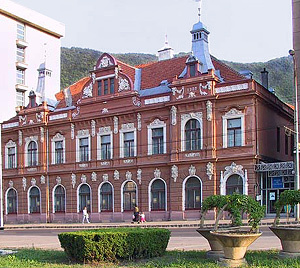 The Jewish Community of Brasov was officially founded 19 years later, followed by the first Jewish school in 1864 and the building of the Synagogue in 1901. The Jewish population of Brasov expanded rapidly to 1,280 people in 1910 and 4,000 in 1940. Today, the community has about 230 members, after many families left for Israel between World War II and 1989. Open: Mon. - Fri. 10:00am - 1:00pm; Closed Sat. & Sun. Take a historical walk through Brasov's medieval section and discover the largest Gothic church east of Vienna, the Town Council Square and the city's 14th Century fortifications. The tour ends with a general view of the Old Town from one of Brasov's medieval towers. April - May: every day at 6 p.m.
June - September: every day at 10:30 a.m. and 6 p.m.
October - March: every day at 3 p.m.
Tour starts: from Piata Sfatului (Town Council Square), next to the fountain. Duration: two hours and 30 minutes. If you liked the tour you can tip your tour guide. 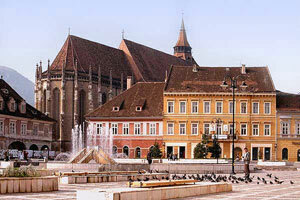 In the centre of the square stands the Old Town Hall (1420), now home to Brasov's History Museum, while the southeast corner is dominated by the town's most famous landmark, the Black Church. The square is surrounded by the renaissance-style Merchant's House (now the Cerbul Carpatin restaurant), the beautiful archway of the Orthodox Cathedral and the memorial museum of the Mureseanu family. there are several hiking trails that practically begin at the edge of the Old Town. This is the most demanding trail, with two steep ascents including a 167-step climb. However, it offers more spectacular panoramic views of the city of Brasov than any other trail. Open: Tue. - Sun. 10:00am - 6:00pm; Closed Mon. The ground and first floors of the museum feature a national gallery of canvases, starting with anonymous Transylvanian painters of the 18th century up to the who's who of Romanian 20th century artists, including Theodor Pallady, Nicolae Grigorescu, Stefan Luchian and Horia Bernea. The museum also displays works by Brasov-born Janos Mattis-Teutsch (1884-1960), one of the most influential Romanian artists, as well as sculptures by Corneliu Medrea, Ion Jalea, Frederic Storck and Dimitrie Paciurea. French photographer Brassai, famous for his portrayal of Paris at the beginning of the 20th century, was born in 1899 in Brasov. Upon his move to France he took on his artistic pseudonym Brassai, which means 'from Brasov'. Visit the cellar level for a look at the beautiful European crystal and porcelain, as well as a large collection of Oriental vases and statuettes from China, Tibet and Persia. Housed in the Old Town Hall building, the History Museum of Brasov displays rare exhibits and collections showcasing Brasov's history from ancient to modern times: tools made in stone (Paleolithic age), painted ceramics discovered at Ariusd (Neolithic age), tools made in bronze and iron, armor, ancient weapons and farming tools. 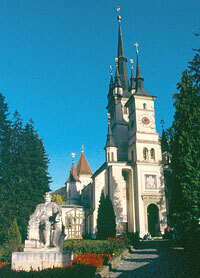 The exhibits also tell the history of the Saxon guilds, which dominated Brasov during medieval times. 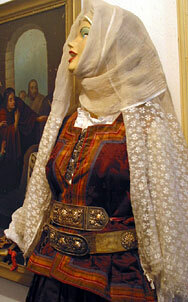 The Ethnographic Museum exhibits silver jewelry crafted in Brasov during the 16th century, fur and sheepskin coats and other folk costumes; black and white photographs illustrate exactly how they were worn and by whom. The museum also presents the evolution of weaving from an old spinning wheel to a mechanized loom. Folk arts and crafts are available at the museum gift shop. Housed on the grounds of St. Nicholas Church, this was for centuries one of the leading learning centres of the Romanian people. The printing press that opened here in 1556 produced some of the first books written in Romanian. The museum hosts a compelling legacy: more than 4,000 rare books (many printed or copied by hand right here), several hundreds rare documents, the oldest Bible (printed on goat's skin) and much more. It took 20 workers and eight translators months to finish just one book. Quirky and charming would well-describe this unusual family museum situated across from Brasov's Council Square. Established in 1968 through family donations, the museum features letters, photographs, newspapers, rare books, paintings, sculptures, 19th century furniture, heirlooms and keepsakes of the musical and literary members and in-laws of the Mureseanus. Jacob Muresan, first in a long line of Mureseanus, was a teacher who married into wealth and in 1838, became the founding editor of the Transylvania Gazette. Its 25,000 documents comprise the largest family archive in Romania. The Mureseanus were the founders and owners of a political newspaper, Gazeta de Transilvania, for more than half a century and corresponded with the most important politicians in Transylvania and other regions of Romania during the second half of the 19th and the beginning of the 20th centuries. This small museum, housed inside the bastion, exhibits Middle Age documents, photographs of long-lost bastions, armor, impressive Turkish weapons decorated with Arabic inscriptions, tools used by local artisans, guild flags, a street lamp from the 16th century, pieces from an aqueduct, rare books and much more. Most impressive is the elaborate small-scale model of Brasov circa 1600, made in 1896 for the Millennium Exhibition in Budapest. A 15-minute drive or 30-minute bus ride from Brasov leads to Poiana Brasov (3,300 feet), a mountaintop ski and summer resort. During winter months, Poiana Brasov offers some of the best skiing in Romania. In the summer, it is a great place for hikers to launch treks into the Southern Carpathian Mountains. For a panoramic view of Brasov and the more distant Bucegi Mountains, take the cable car to the summit of Postavarul Mountain (5,756 feet). Hollywood celebrities Jude Law, Renee Zellweger and Nicole Kidman relaxed in Poiana Brasov after shooting the film Cold Mountain on location in nearby fields and farms. (Prejmer is a short train journey from Brasov on the line towards Sfantu Gheorghe. The train station is located 2 miles from downtown. Bus # 4 runs from the train station to Piata Unirii in the city centre. There are 3 direct international trains from/to Budapest. One of them continues to Vienna and another to Bratislava and Prague. Trains to other western European cities run via Budapest. There are daily trains from/to Bucharest connecting Brasov to Arad, Cluj-Napoca, Oradea, Satu Mare, Sibiu, Sighisoara and several other cities in Romania. There is also an overnight train to Suceava. There is daily INTERCITY (Express) service between Bucharest and Brasov (approximate journey time: 2 ½ hours). The SNCFR ticket office offers train schedules information and advance ticket sales. Tickets for same-day travel can only be purchased at the train station. Required documentation: valid ID (passport or identity card or drivers license). operates 47 bus, 'midi-bus' and trolleybus routes within the city limits. The minibus connects the train station with the downtown area and Schei historic district. Bus #4 connects the train station with the bus stop for buses departing to Poiana Brasov. 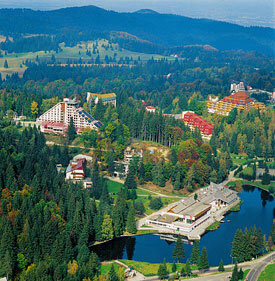 The bus connects the city centre with the beautiful resort of Poiana Brasov. Buses to Bran, Rasnov and Moieciu depart from Brasov's Autogara # 2 (aka Autogara Bartolomeu). Bus / trolleybus ticket cost: 4 Lei (approx $1) for two trips. valid on all bus lines except bus # 20! One ticket for bus # 20 (Brasov to Poiana Brasov) costs 5 Lei / trip (approx $1.25). Tickets can be bought from the RATBV kiosks. or check our Romania Accommodations Guide. Folk crafts, such as embroidered clothing and linen, painted or beaded eggs, carpets, pottery, woodcarvings and icons, make interesting gifts and souvenirs. Romanian peasants do magnificent embroidery on cotton, wool and leather. Look for blouses, skirts, exotic coats, rugs, tablecloths and lacework. Icons, new and old, painted on glass or wood are outstanding. Mon. & Fri.: 10 a.m. - 3 p.m. Tue., Wed. and Thu. : 9 a.m. - 5 p.m. Sat. & Sun. : 11 a.m. - 2 p.m.
(tourist attractions, events, accommodations, restaurants and transportation).